Simplifying the Event Management Process. Make use of this modern software solution to increase attendee satisfaction and create sellout events with ease! are easy to access and monitor. Use your own logo, header image and customize the text on your home page – without needing to know a fancy programming language. We’ve designed the site layout tolook good on the largest of monitorsto a smartphone. Review and then accept or decline submitted sessions. Create one or multiple tickets that are free or paid, create discounts on ticket prices, secure online payment processing, and more! Track key metrics such as tickets sold, tickets available, etc. We are here to ensure your event is a success. We’ve created a support portal that addresses many questions or you can contact us! 2.9 % + $0.30 credit card processing fee for online transactions. We can assist in your setup for a nominal fee. Integrate into your existing website or use our platform to run your customized site with your own look and feel. Stop losing customers and allow them to purchase when they want to, online and securely. Create new events or duplicate existing events with ease. These events show up on your calendar when created. Create one or multiple tickets, ticket specific discounts, ticket sale windows and control over when the ticket is visible. Import codes from coupon sites, or create your own. Track which codes are being used to understand what’s working. Create and sell gift certificates online. Your customers can easily redeem these gift certificates online when they register for the next event. Easily reward your customers and build a loyalty program where they can redeem points earned online. Handle at the door registrations or log cash registrations to ensure your reporting reflects everything. Create and manage Event Reminder, Event Follow- up/Thank you and Order Confirmation emails. Create products for sale online and manage your taxes and shipping rates with ease. You have full access to our support portal with help articles and videos that walk you through the use of the platform. our platform and give you a demo. Schedule a demo to get an inside look at how Attendee Events could work for your business. We are looking forward to helping you reach your goals. Attendee Events simplifies the event management process. Event managers and planners can make use of this modern software solution, to increase attendee satisfaction and create sellout events with ease. Effective event organization is made easy with Attendee Events. 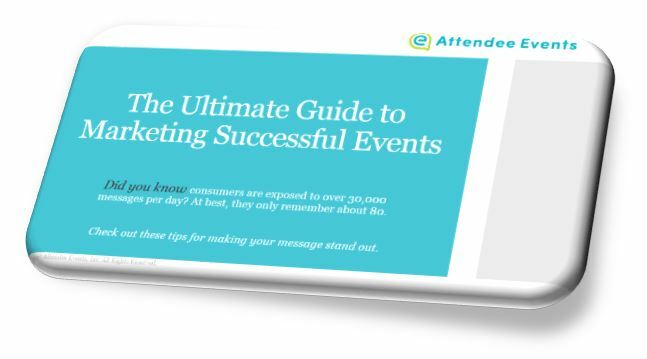 Learn the secrets to effective event marketing. Get monthly updates from Attendee Events in your inbox. Stay updated on the latest news and releases. Stay relevant in this high-paced industry with our event management tips and product updates! We will not sell or share your email adress, period. Download our Free Marketing Guide!